With the help of our distinguished professionals, we have been able to bring forth Flowering Stimulant. These precisely formulated fertilizers are made by employing only premium quality ingredients. We utilize modern process technology for optimum efficiency in the production of these products. All our offered fertilizers are made in conformation with the international standards. We offer our clients these products at market-leading prices. 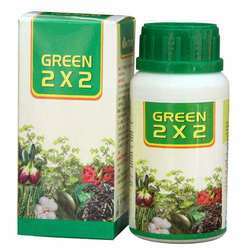 With the help of our experienced personnel, we have been able to formulate Flowering Stimulant (Green 2 x 2). These fertilizers are fabricated by our expert professionals using superior quality ingredients and advanced technologies. The offered products are available in both standard and customized specifications in order to meet the needs of customers. We offer these fertilizers to the clients at industry-leading prices. This product includes quality formulations that help in ensuring more flowering and fruits in all crops. For amazing flowering in all crops. with all types of Pesticides/Fungicides and PGR product.